Senator Obama, even in defeat, is probably the best speaker we’ve seen in 12 years since Bill Clinton ran in this primary. I’m not sure where the transition has come for him. 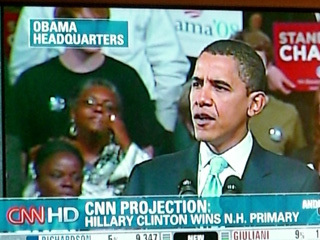 I was present at the 2004 Democratic National Convention in Boston and I saw him make his keynote. There is no doubt his Iowa speech was better and these post-election speaking engagements have set him apart from any other politician we have seen in my COBB (Children of Baby Boomers) generation. His long inflection and soft landing sentences when trying to make his most potent points have become the most fascinating thing about Obama’s public style in the past 5 days. No one is a born speaker. Anyone can learn these things. Although, seeing him on such a roll, I’m not sure that I can believe these bromides.